Time to get cracking. With the opening of the crab season on Tuesday, seafood processors in the Bay Area are filling orders for local Dungeness crab for the first time in a while. Chris Lam, president and CEO of Pucci Foods, a seafood distributor in Hayward, was happy to hear the sound of tiny hammers banging on succulent legs of crab just caught the day before. Last year, there was no local crab because of safety regulations and the danger of domoic acid in the local crab population. Lam said his product is safe, carefully cleaned, kept cold and delivered fresh. 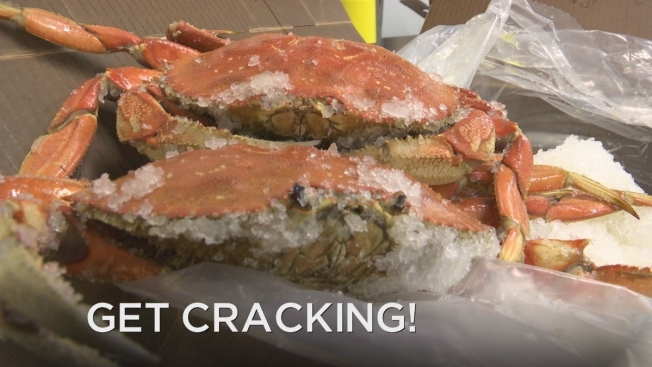 Cracking the crabs in the refrigerated warehouse is chilly work, but Lam said his employees are well-trained and experienced. Hoa Tat's small hands ripped the legs off the crustaceans in a hurry. She said she has been working for Pucci for 24 years and always looks forward to crab season. The Pucci Foods warehouse filled its first crab order Wednesday. The unlucky male crabs had been caught just the day before and boiled that morning, said Jerry Gilson, a warehouse manager. The customer who ordered them ordered 550 pounds of cracked crab on the first day of the season. Crab feed orders make up a big part of Lam's business this season. Now his customers can order online, and hope for a good season.